Wilderness walking, luxury camping and a night at one of the coast’s most iconic sites. 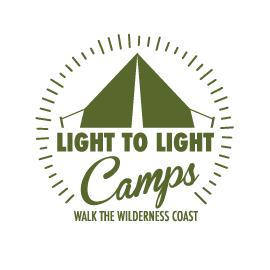 Experience our classic 3-day Light to Light Walk tour, with 2 nights in a luxury camp along the Wilderness Coast, plus an extra night in comfort at Green Cape Lighthouse Cottages, one of the best vantage points in the world for land-based marine whale watching. Luxury camping at Saltwater Creek. Hot showers, comfy beds, cooked meals. One night in the beautifully renovated Green Cape Lighthouse Cottages. All meals and snacks during the hike, delicious and healthy local food, and your choice of drinks. $1,200 per person, twin share. $1,450 per person, single tent, twin share @ Green Cape. In many locations along the track you will have a clear and close view of the mighty Pacific Ocean and a chance to witness majestic humpback whales as they slowly make their way north to the breeding grounds or south to Antarctica. But that’s not all you’ll see. Keep an eye out for the endangered Eastern Ground Parrot or a pod of Killer Whales. When we’re in camp, you might spot a cheeky little possum or a cute little bandicoot as you chill by the fire with your glass of red. And finish with an exclusive evening at remote and wonderful Green Cape Lighthouse, enjoying a hearty home-cooked meal and a luxurious bed to cap off your unique wilderness weekend. A special edition of the Light to Light Walk, featuring an extra night in comfort at Green Cape Lighthouse Cottages, one of the best vantage points for land-based whale watching in the world. We’ll pick you up from your local accommodation in Eden or Merimbula and drive you to the start of the walk at Boyd’s Tower, in the southern section of Ben Boyd National Park. The walk on this day is quite a bit shorter. You’ll be blown away again by the amazing scenery. You’re encouraged to stop along the way for refreshments and to take in the stunning and peaceful surrounds – we’ll tell you about all the best spots that only the locals know! Then it’s on to beautiful Bittangabee Bay where we’ll be waiting in the picnic area with your lunch. Explore the amazing bay, beach and historic ruins before we transfer you back to Saltwater for an evening around the campfire. After breakfast, we’ll get you back to Bittangabee for the last leg of the journey to Green Cape Lighthouse. This part of the walk reveals sections of nice and shady ti-tree forest, and open heath where you may spot a kangaroo or a very rare ground parrot. Perched high on the tip of Green Cape where the Pacific meets the Southern Ocean, the 360 degree views from Green Cape lighthouse often take in seals, whales and dolphins playing off the coast. We’ll lay out a picnic at one of the viewing spots around the cape. Afterwards, we’ll take a short walk back in time to the small graveyard where lie the 71 victims of the Ly-ee-Moon shipwreck in 1886. You can kick back and relax now. Celebrate your achievement whilst enjoying the view – and whale-watching – from the rocky outcrops or your cottage verandah. Settle in for a hearty warm meal in your cosy accommodation while you share stories of your adventure. Sink into a comfortable bed and let the atmosphere massage you into a great night’s sleep. After a delicious breakfast, we’ll transport you back to Eden (or beyond, if pre-arranged), furnished with insider recommendations on the best local restaurants and spots to enjoy lunch or coffee in this little fishing town that is truly one of Australia’s hidden gems.